Kazuo Nakamura was one of the founding members of the Toronto-based Canadian abstract group Painters Eleven. His interest in the relation between mathematical perfection and visual medium led him to investigate the ways in which form and dimension are linked. His analytical approach inspired many abstract painters. 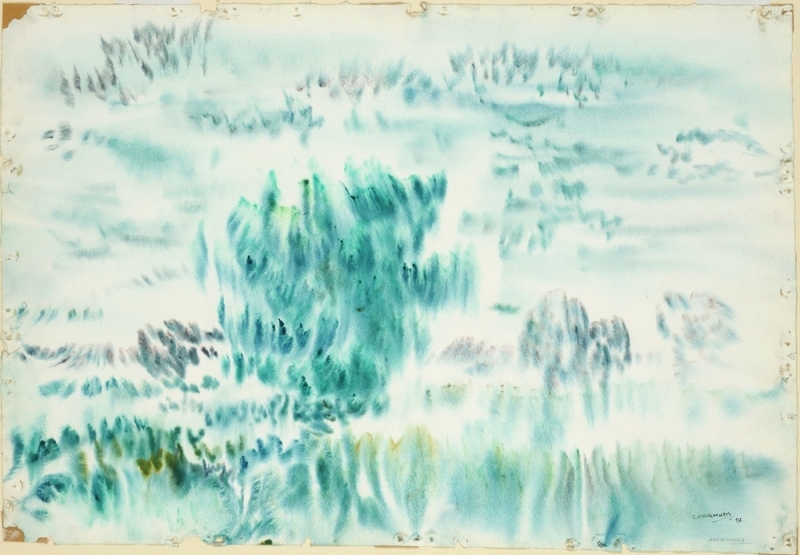 Born in Vancouver in 1926, Nakamura was only 15 when the Japanese bombed Pearl Harbour, and his internment in camps on the West Coast inspired his early watercolours. He went on to study at the Central Technical School in Toronto, graduating in 1951. In October 1953, Nakamura took part in "The Abstracts at Home," a seminal show held at The Robert McLaughlin Gallery, Oshawa, which ushered a new era in Toronto painting. The meetings between the avant-garde artists who participated in the show gave rise to Painters Eleven. The group ran until 1960. 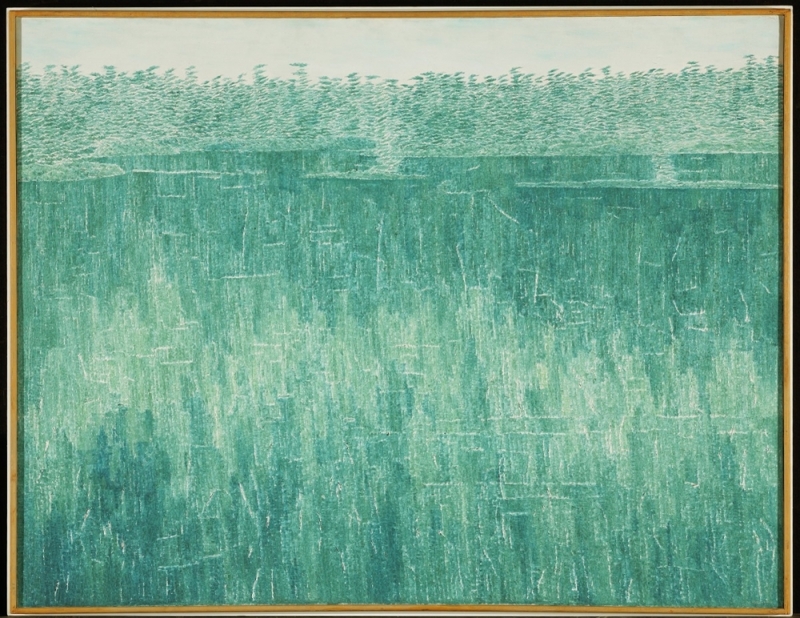 From his early stylized landscape paintings, Nakamura moved towards more abstract compositions, which represented his interpretations of the "universal patterns" found in nature as predicated by science. 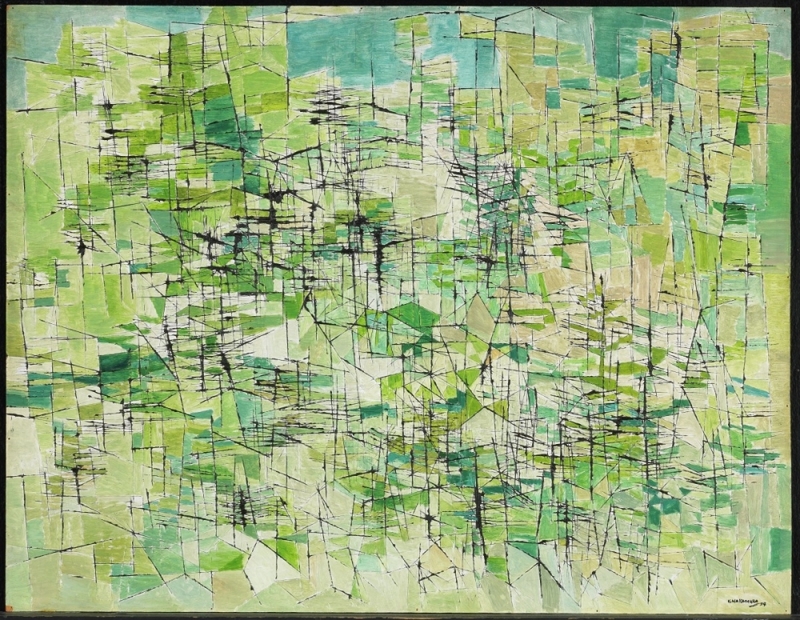 Works like Landscape, Green Hill-side (1954) illustrate the artist's fascination with these universal patterns. Near the end of his life, Nakamura began creating calligraphy-like works composed of strings of numbers, along with his more colourful, abstract pieces. He was part of numerous national and international exhibitions. A touring exhibition of his artwork travelled throughout Canada in 2001-2002. The percentage above low estimate collectors have bid in the past 5 years. The amount of pieces bought in the last year of this artist. The percentage of pieces that sell on auction. Our experts have identified this artist as having some investment potential. We consider their work as a fine investment. Need more data, analytics and research? Luckily ArtVenture has written an in-depth investment report on this artist. The graph compares the yearly average hammer price of Canadian art with the artist's average yearly price. A value of zero means there weren't any sales that year. The graph compares the yearly performance of the S&P500 with the artist's average yearly price. A value of zero means there weren't any sales that year. The graph evaluates how the artist's lots sold compared to their low and high estimates on auction. The graph plots the different sizes of the artist's work so you can clearly identify the most valuable and rare artwork size. Understand the median prices of the artist's work as it was sold on auction. The seperate price points allow you to understand the price that the majority of pieces are bought and sold at. We breakdown the Post-War and Contemporary auction at BYDealers on November 5th. From sell-through rate to previous auction data, our infographics cover it all. Why Invest in Guido Molinari Now? What’s the state of Guido Molinari market? How long does it take to resell? What’s the evidence of return & price volatility? We focus on previous auction data, not primary market sales. Our data may be incomplete or slightly inaccurate. Although we have comprehensive historical data on each piece, artist, their work, and their series drastically differ based on the artistic content, condition of the piece, colouring, methods, and many other factors. We therefore cannot guarantee that we, ArtVenture, can appraise or give you an exact representation of the future price and performance of the artwork and recommend you not to put undue reliance on this data. ©2018 ArtVenture Analytics. All rights reserved.